Please include attribution to thaut.io with this graphic. When you lead a group of people to embrace "your way" of doing what you do as "the way," your business becomes the only place that delivers what they now demand. You can send your competition to another zipcode while the customers come with you to this new space. Avoid "filler content" and keep your business from getting lost in a sea of sameness. If you aren't leading your audience to the new, then you're just parroting what others say and contributing to content pollution that adds no distinctive information, motivation, or inspirational value. Thought Leadership offers relief from the sameness syndrome. Instead of treating prospects as objects, lead to greater value. Respect is the doorway to deeper (customer) relationships. Some well known big-tech companies treat customers as objects of manipulation in service of advertising optimization. These corporations study them to the level where customers feel their privacy is invaded. Great thought leadership learns what customers want and expands their choices so they can better get it. It isn't just about results, it's about personal satisfaction. Since Thought Leadership means leading people to the new, it implies creativity. Thought Leadership is also about serving others to help them to get more out of what you sell. Creativity, leadership, and service all feel good to do. Hence, the acronym CLaaS- aHA. Creative Leadership as a Service as High Art. High Level Influence Thought Leadership can open up new possibilities. It's not just about helping people increase their knowledge. Thought Leadership can also lead people to change the higher level thinking of values, beliefs, and identity. For example, when Thought Leadership influences on a paradigm level, it can release people from the trap of limiting beliefs. A website is more than a design- it's a placeholder for your leadership. It isn't about using filler text to populate a pretty web design. While great design is important, most companies have that now and it won't set you apart. Instead, it's about leading the market to new thinking that sets you and your company apart as the obvious, only choice. Show your company's expertise and leadership in your content. Doesn't it demonstrate excellence to also stand out in your content leadership? Isn't it more competitive to have content that stands out with clear leadership? 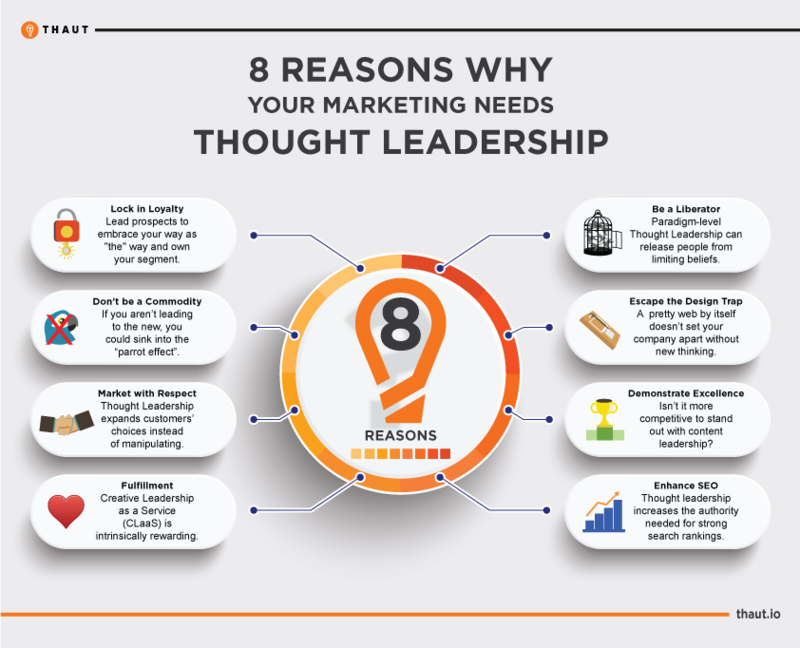 Thought leadership increases the authority needed for strong search rankings. SEO without Thought Leadership is like a photograph of a sculpture in comparison with the sculpture itself- Thought Leadership adds another dimension of depth and enhances SEO by adding new types of searches. It expands your business' keyword universe so you pull from places your competitors don't even think of.